"This box includes - 'The Girl With The Dragon Tattoo' - Disgraced journalist Mikael Blomqvist is hired by Henrik Vanger to investigate the disappearance of Vanger's great-niece Harriet. Henrik suspects that someone in his family, the powerful Vanger clan, murdered Harriet over forty years ago. Starting his investigation, Mikael realizes that Harriet's disappearance is not a single event, but rather linked to series of gruesome murders in the past. He now crosses paths with Lisbeth Salander, a young computer hacker, an asocial punk and most importantly, a young woman driven by her vindictiveness. 'The Girl Who Played With Fire' - Lisbeth Salander is wanted for a triple murder. 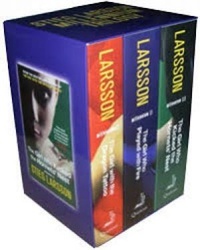 All three victims are connected to a trafficking exposé about to be published in Mikael Blomqvist's magazine Millenium, and Lisbeth's fingerprints are on the weapon. Lisbeth vanishes to avoid capture by the justice. Mikael, not believing the police, is despairingly trying to clear her name, using all his resources and the staff of his magazine. During this process, Mikael discovers Lisbeth's past, a terrible story of abuse and traumatizing experiences growing up in the Swedish care system. 'The Girl Who Kicked the Hornets' Nest' - Two seriously injured people arrive at the emergency ward of the Sahlgrensa hospital in Gothenburg. One is the wanted murderer Lisbeth Salander who has taken a bullet to the head and needs immediate surgery, the other is Alexander Zalachenko, an older man who Lisbeth has attacked with an axe. In this third novel in the Millennium trilogy, Lisbeth is planning her revenge against the men who tried to kill her, and even more importantly, revenge against the government which nearly destroyed her life. But first she must escape from the intensive care unit and exculpate her name from the charges of murder that hangs over her head."